An ancient Indian folk tale explains how we each have different perceptions of the world. Some Hindus had brought an elephant for exhibition and placed it in a dark house. Six men, who had never seen an elephant, went into that dark place, one at a time, to see the elephant. Finding that in the darkness, visual inspection was impossible, they felt it with their hands. The palm of the first fell on the trunk. "This creature is like a snake," he said. The hand of the second lighted on an elephant’s ear. "Oh no," he exclaims, "It's like a large leaf." The third man felt a leg. "I found the elephant’s shape is like a tree," he said. 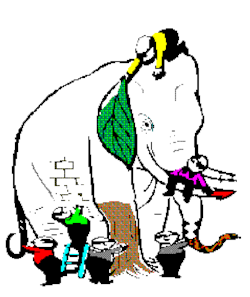 The fourth caught hold of its tail, "Nonsense, an elephant is just like a rope." The fifth man placed his hands on the side of the beast, "It's just like a brick wall," he said. The last man, feeling a tusk, asserts, "You are all wrong, it's like a sharp spear!" No one sees anything from all points of view. can we come close to "seeing" the whole. The nature of our relationship with the environment (subordinate to nature, harmony with nature, dominant over nature). etc. These beliefs structure our view of the world. 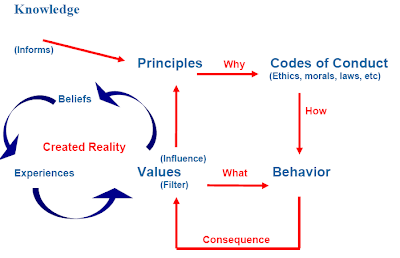 In turn, our personal world-view gives rise to a unique set of personal value priorities. The reverse is also true. Knowing a person's value priorities, makes it possible to gain insights into how a person views the world. Only through true dialogue, in a genuine effort to understand each other's worldview (i.e. understand why we each see what we see and why we each believe what we believe), can we create a peaceful world.